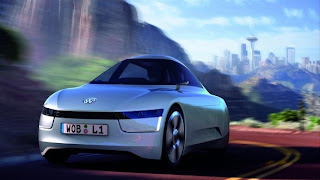 The Volkswagen L1 Concept two-seater is powered by a new common rail turbo-diesel (two-cylinder TDI) and an electric motor. With its average fuel consumption of 1.49 litres diesel per 100 kilometres with CO2 emissions of the 160 km/h fast concept car are just 39 g/km. The TDI, E-motor and 7-speed DSG are located at the rear. The Volkswagen L1 Concept primary drive source is a completely redeveloped two-cylinder turbo-diesel with common rail direct injection (TDI). It is operated in two different modes depending on the load conditions. In the standard “ECO” mode, the 800 cm3 TDI develops a power of 20 kW / 27 PS (at 4,000 rpm); in “Sport” mode – used to reach top speed, for example – the car’s power rises to 29 kW / 39 PS (at 4,000 rpm). The TDI’s maximum torque is 100 Newton-meter (at 1,900 rpm). Naturally, the Volkswagen L1 also has a Stop-Start system that automatically shuts down the engine when vehicle has stopped and restarts when the accelerator or E-pedal is pressed.